The Hubble Ultra Deep Field is a particularly dark patch of sky about the size of a grain of sand held at arm’s length. 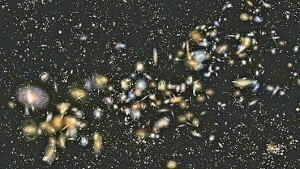 It was first imaged by the Hubble telescope in 2004, and was found to contain about 10,000 galaxies in its field of view. Other observations of this patch of sky have been made over the years, so that we now have images ranging from infrared to ultraviolet. The galaxies of the HUDF are among the most distant ever observed, stretching back to the earliest age of galaxies. Since Hubble can only detect light within the roughly visible range, its view of the galaxy formation period is limited. 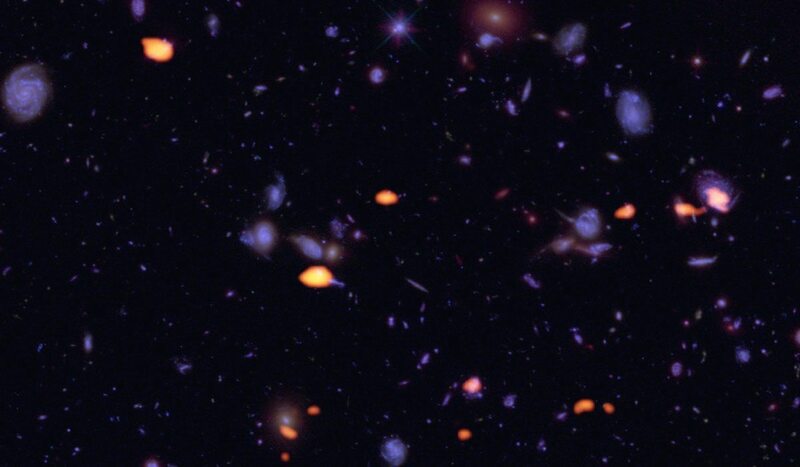 But now the ALMA telescope array has captured the HUDF, and it’s given us a new view of these distant galaxies. ALMA is a radio telescope capable of viewing the sky at millimeter and submillimeter wavelengths (just below infrared), which is the type of wavelength that cold gas and dust emit. Since these wavelengths are longer than infrared, ALMA can also see more distant galaxies than Hubble, since the light of distant galaxies are greatly redshifted. The ALMA survey was able to see galaxies rich in carbon monoxide (CO), which is commonly found in large molecular clouds that can trigger star formation (seen in yellow in the image above). Since cold CO gas emits a specific spectral fingerprint, ALMA could also determine the redshift and thus the distance of these star-forming galaxies. They found that more distant galaxies had higher CO levels than less distant ones, which could have triggered the peak period of star formation that occurred when the Universe was about 4 billion years old. Thanks for that image of a window the size of a grain of sand at arm’s length. That gives me more perspective than big or small numbers, because I can actually imagine it. I guess that window would have to be super tiny, because those objects we see in it are so very far away if they still exist.